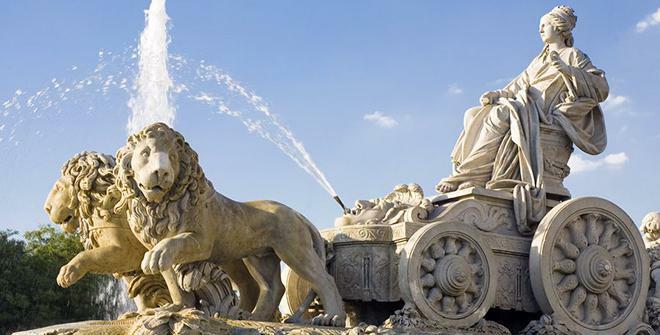 Eliezer Levin filed suit in New York over a 2-foot statue of the Anatolian goddess Cybele, who is pictured above at a fountain in Madrid, Spain. MANHATTAN (CN) – In a globe-hopping art lawsuit, an Israeli art collector asked a U.S. judge Wednesday to declare that he has a valid title to an ancient Roman statue of an Anatolian goddess claimed by the Turkish cultural ministry. Represented by the Manhattan firm Wilmer Hale, collector Eliezer Levin says Turkey brought a claim of ownership for his 2-foot-tall marble statue of Cybele in 2016. Levin had consigned the statue for sale that year to an auction house in Tel Aviv, which exported it to the United States, where it still remains. Though Levin and the unspecified New York auction house have agreed to hold the sale, Levin claims that U.S., Israeli and international law attest to his good title. Scholars recognize Cybele as the only known goddess of Phrygia, the first kingdom in west central part of Anatolia – territory in the heart of modern Turkey. Dayan is primarily remembered as a revered Israeli military and political leader who wore an eye patch after fighting Vichy forces in Lebanon, but has a lesser-known legacy as an amateur archeologist with a reputation for looting antiquities. “The plinth bears a dedicatory inscription in Greek reading: ‘Asklepiades son of Hermius from the city of Side the ‘Mother of the Twelve Gods’ has dedicated as a vow’ 1st century CE Private collection,” it continued. At the time, three Israeli agencies sponsored the exhibit, which was shown inside one of the country’s largest museums. Levin’s attorney Sharon Levin at Wilmer Hale has not responded to email and telephone requests for comment. Neither did the Turkish Embassy in Washington, D.C., which was sent an inquiry after business hours in Turkey.